8901 West St. Rt. 73, 1.5 miles west of Caesar Creek Flea Market. Chester Twp. with 60 acres of mature beech-maple forest. 1.2 miles of hiking trails, paved parking lot with a turnaround, and bridge at entrance. Several examples of large hunks of Canadian granite erratic rocks deposited in the Preserve. Look for them along the 1.25 mile hiking loop that circles the forest perimeter. Open daily. Dawn to dusk. Adams Twp. with 58 acres of rolling topography dominated by a mixed forest of deciduous hardwoods and evergreens. Paved parking lot with 5 benches, information display and 2 waste containers. 0.8 miles of hiking trails. Three hiking trails are available; white, yellow, and blue. White and yellow trials are strenuous with steep inclines. Rich biodiversity of ferns (12 species), trees (51 species) and many wildflowers and birds. A demonstration prairie is surrounding the parking lot offering 18 species of wildflowers among warm season grasses. 2979 Clarksville Rd. at the intersection of Cowan Creek Rd. and Clarksville Rd. in Vernon Twp. 60 acres of very unique land referred to in scientific literature as “The Devils Backbone”.A gravel parking lot with 3 benches, 2 waste containers, and an information kiosk. 1.25 miles of hiking trails along the scenic Cowan Creek. Great fishing in April through June. Identified by the Ohio Biological Survey in July, 1955 and again in July, 1978 as the most unique area biologically in Clinton County! The Devil’s Backbone has more biodiversity in plants and animals than any other square mile in Clinton County. The Ohio Audubon Society has recognized the Cowan Lake Region as an Important Bird Area with over 85 species breeding in the area. Only 70 IBA’s exist in Ohio. 935 Webertown Rd. in Clark Twp. 70 Acres 1 mile east of the Oak Grove Rd. and Webertown Rd. intersection. There is a paved parking lot for 8 cars but no amenities. 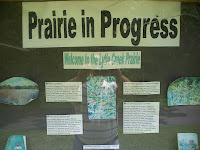 2.5 miles of hiking trials around a short grass prairie and a tall grass prairie. 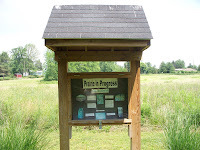 2 wetlands were constructed and prairie grass seed were donated by the U.S. Fish and Wildlife Service. Good fishing is available in the East Fork of the Little Miami River. 6 distinct habitats can be found in the park; upland woods, wet woods, riparian woods, short grass prairie, tall grass prairie, and blocks of cedar trees. Healthy amphibian, wild turkey and white-tailed deer populations. By the 4C Bike Trail in Wilmington. 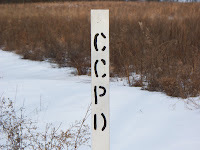 Over 11 acres of preserved prairie land.